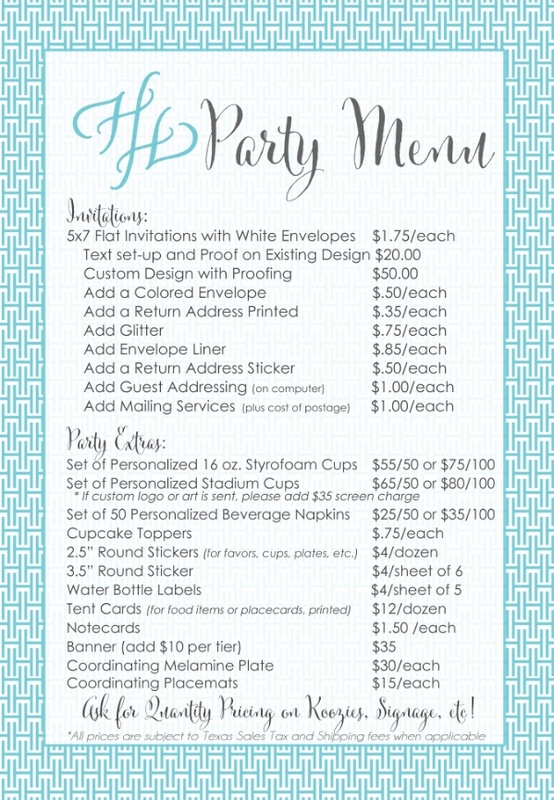 Shown are our most popular options for parties like Birthdays and Bridal or Baby Showers! The pricing is fairly straightforward and we work with you to create the perfect design. Due to the Custom Nature of Wedding Invitations, there is no set price list but we'd love to visit with you on your preferences and details and prepare a quote especially for you! Please email us or set up an appointment to discuss your event and we will gladly present you with quotes on all work prior to production. A deposit is required at ordering. From this point, you will have the opportunity to review your design and proofread your content. Once approval is indicated, production will begin. We cannot be held responsible for any changes after this point and if necessary, additional charges may be incurred. Thank you for your interest! Email us today to get your project started.